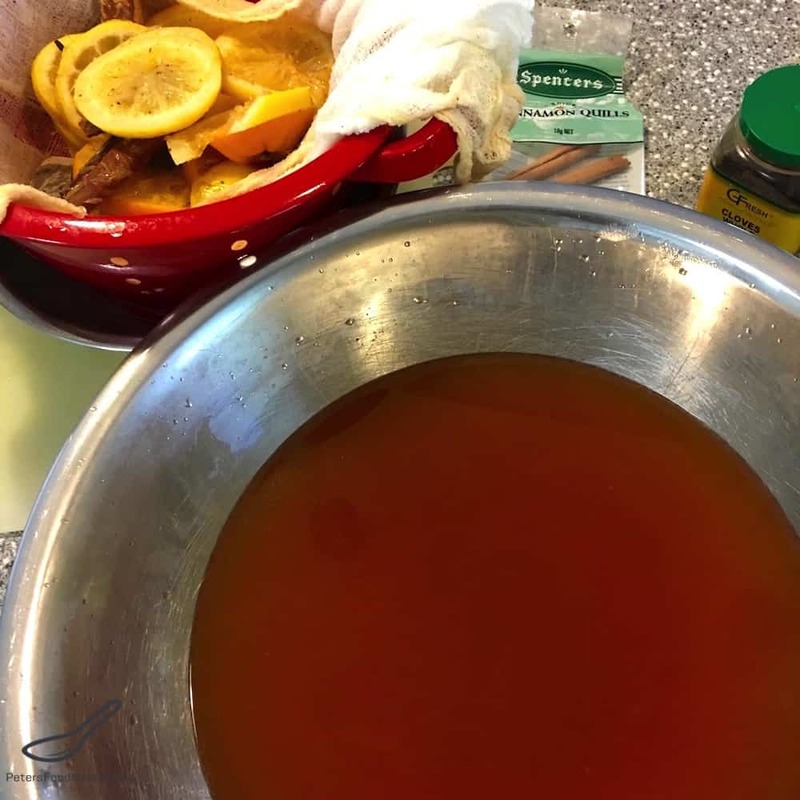 This ‘Russian Tea Recipe’ is the name of an American citrus spiced tea , which is popular around the holidays, as are most spiced drinks, but you don’t need to wait for the holidays to have this tea. There are many variations of this recipe, most of them using a dried powdered mixture of instant tea, Tang orange drink, and spices. You might see recipes on Pinterest that make tea mixtures that you prepare in advance. Whilst a mixture like that is convenient, I’m going to make a real steeped tea with real fruit and spices. Nothing artificial in this recipe. Is this tea even Russian? No! This tea recipe is actually not Russian in origin at all, but an American invention. Russians love their tea and are amongst the worlds largest consumers of black tea, which is surprising to some people. You can combine the per capita tea consumption of Canada, Australia and the USA to equal what Russian consume annually. So it’s a bit confusing for some people who think that this tea recipe from Russia. It’s not. This popular recipe isn’t often found in stores or restaurants, but is more commonly found in cookbooks or made at home. I think the Tang drink company did very well with the powdered version of this recipe. As Tang isn’t available in Australia, I make this healthier version which I think tastes better too. The way that Russians prepare black tea is different from most cultures as well. Loose leaf tea is brewed in a small teapot, to make a concentrated tea, which we call zavarka (заварка). The zavarka is poured into individual cups, then topped up with boiling water to the top. That way you can then control the strength of your tea. A Russian samovar, which literally means self boiler, was traditionally used to boil the water. So this is what I think of when I hear people say Russian Tea. However, this American spiced tea is a winter favorite for me. 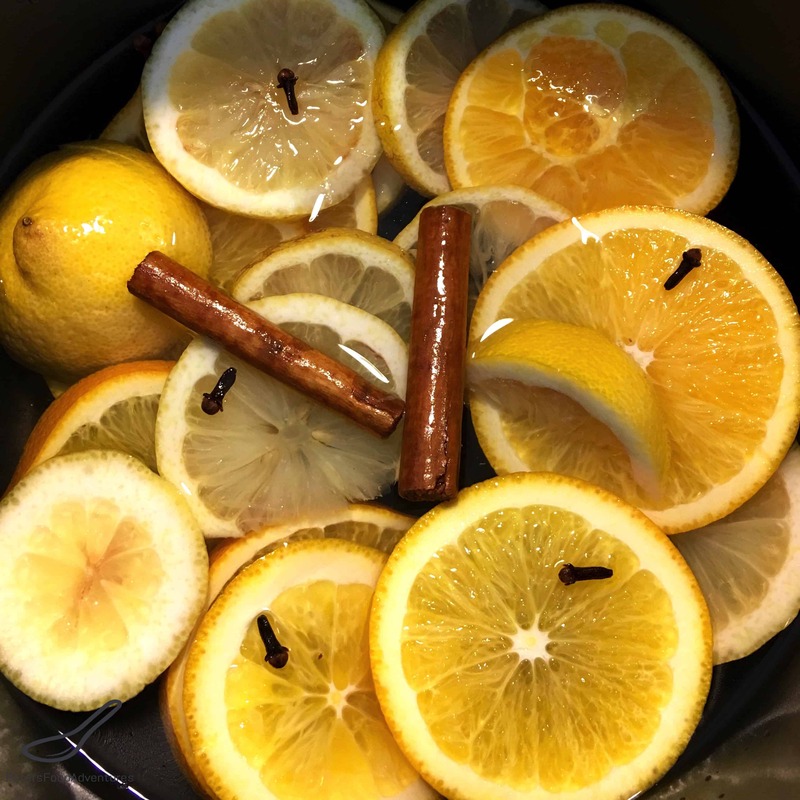 An easy mix of teabags, lemons, oranges, cinnamon, cloves, and nutmeg. I don’t use orange juice when making Russian Tea, just the orange slices. Too much orange juice will overpower the recipe for me, nobody likes drinking hot orange juice. I used 3 medium oranges, or use 2 large ones. This creates a fantastic flavored beverage. Russian Tea made without Tang, and definitely not Russian. But maybe just don’t tell anyone and enjoy. It’s so easy to make. Bon Appetit! Приятного аппетита! In a pot, combine the water, oranges, lemons, cinnamon, cloves, nutmeg and sugar and bring to a boil. Boil for about 5 minutes and remove from heat. Add the tea bags into the mixture and allow to steep covered for about 5 minutes. Remove the fruit, spices and tea bags (without squeezing out the bitter tannins out of the bag). Taste and adjust sugar to taste. Serve immediately, reheat if necessary. Ohhh! Yumm! The photos are fantastic!!!!!! Sounds interesting and delicious. Can you reheat any leftover or drink it iced? Sounds yummy! I’m quite partial to Kusmi Tea’s Russian blends “Anastasia” and “Bouquet of Flowers No. 108”. Thanks Didi, I love tea, but haven’t heard of those. I’m gonna search them out! ???? Really good. My kids like it really sweet so I added more at the end. After it was ready and piping hot I poured it into a pitcher full of ice. Really great ice tea and the citrus with the spices are a really nice combination. Great idea, perfect for your summer, our winter here! I recently moved to Australia and I have a powdered version of this recipe but since I can’t find any of these ingredients in Australia like I can in Canada, this really helped out and tastes amazing! I can’t get many Ukrainian or Russian foods so this makes me feel less homesick for mum’s Sunday meals. Hi Michaila! Thanks so much for your wonderful comments! I know just how you feel! When we get visitors, they usually bring a suitcase of foods we miss, and Ny-Quil of all things!! So glad you discovered the website. Enjoy! I love your history in it, I’m trying to figure out why it’s called Russian Tea in the first place. The kind I’ve always made came from a DIY site that had you using all fruit juices and black tea. I’m now wondering if there is any variant of this that might have come across the pond? Anyhow, thanks for the lovely read and new recommendations. Hi Christena! I don’t know why it’s called Russian tea, it’s sure funny American invention, but tasty. Authentic Russian tea is made with zavarka, which I will post soon. Thanks for checking it out!